Please check out the HELPFUL HINTS further down the page before starting. 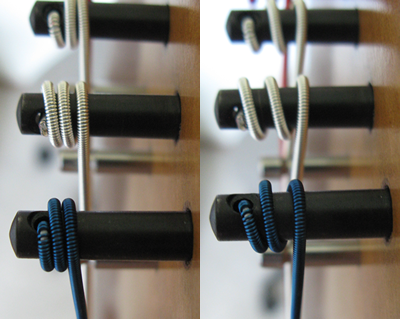 There are many ways to tie harp strings and if you have one that you like, you certainly can stick with it. This one I like because after you cinch it up, the end stick doesn’t fall out as you’re stringing your harp. Also, if you’re using Fuourocarbon strings, this knot WILL hold. The old method is on this site. If you have broken one of the larger gauge monofilament strings (in the lower register) you will want to follow the directions for string tying for lower gauges. So, to get started, you will need the full length of string from your string package. Then cut an inch long piece of a large gauge string, like .055. This will be your end stick. 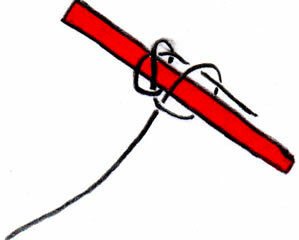 Make a regular overhand knot and put your end stick (or string tie) through the knot. Put it around the end stick that also includes the string end. This is basically a half hitch. You can then thread your string into the hole in the back of the harp, through the lever and up to the tuning pin (see the first helpful hint for an easier way). Check out this new video series by Steve Moss. He recently gave a class on harp care at Lyon & Healy West where Michele Rasmussen took a few videos of him demonstrating techniques for tying harp string knots and securing a new string on the tuning pin. When you're replacing the highest strings, you may have noticed that it is difficult to find the string hole from inside the sound box. One thing you can do is, before you tie your end knot, thread the string through the soundboard hole from the front of your soundboard. Pull the string through the back sound holes and then make your knot. 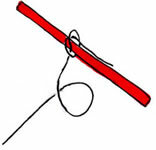 This will only work if your string is long enough to allow you to make the knot without pulling it through the string hole. You may not understand what I'm talking about, but if it happens to you, I think you'll understand. You may not need to use string ends for the higher gauge strings (lower sounding strings) like from .045, .050, .055 etc. 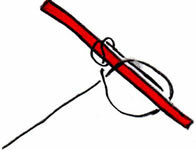 Follow directions on the string tying for lower gauges. Another thing you can use for a string end is leather shoelaces cut into1 inch lengths. I have never tried toothpicks but I have heard they would work. Also the sticks between the cotton of Q-tips. In a pinch, you might need to get creative. Let me know if you come up with some great idea. Now that you’ve got the knot tied at the end of the string, you’ll need to thread it past the lever and through the tuning pin. Here’s what I do to cinch the knot on this end. This works for all strings but the bass wires (see below for these strings). Line up the hole of the tuning pin so that it is vertical. Standing behind the harp, thread the string through the hole (it should be going straight up past the center of the lever and through the hole in the tuning pin) and pull it back towards you. Then slip the string below the tuning pin and between the wooden neck of the harp and the string you just threaded up through the tuning pin. You will be pushing the string toward the front of the harp now. Bring it up between the tuning pin you’re stringing and the tuning pin of the string one note below and pull it out away from the harp. Begin tuning up the string. The first wind should catch around the end of the string. Make sure your winds go toward the neck of the harp as you tune (unless your pins are the type of pin that wants you to make the winds go away from the neck. I believe Tripplet pins are like this). Try to get a straight line from the tuning pin to the bridge pin, especially in the bass wires. Using the cutters of the needle nose pliers, cut off all of the extra string to avoid any buzzing and to keep your harp tidy. Pull the bass wire all the way through the tuning pin straight up. Cut it off 3" above the tuning pin. Push it back down so it is ALMOST flush with the tuning pin, just barely sticking out (less than the width of the string). Begin winding the slack around the tuning pin until you have it to pitch. This method helps to cut down on sharp edges cutting you or your case. You can see me demonstrating this on a video. Robinson's Harp shop has this to say about the Bass wires: The Bass wires are wound with a silver plated soft copper. Even though tarnished bass wires don't affect the sound of your strings, you can wipe them with any liquid silver cleaner and let them dry. The silver plated soft copper is our only string material (except the blue and red). We have not tried this but if Sue Raimond at Robinson's says it works, it must be OK. Let us know your experience if you try it. New strings will need to stretch before they will hold a pitch for any length of time. You might want to over tune the string about 20-50 cents (this is a musical tuner measurement) and then stretch it a little. It will again fall way below pitch. Do this a couple of times being careful not to stretch or over tune it too much or it may break. If you are in the middle of a performance, you’ll need to get it to hold pitch before you play so keep talking to the audience while you stretch and tune, stretch and tune. I hope this has helped to get you on your way to tying harp strings. If you have questions, come to one of my workshops at the next confernce, visit our booth or call me and I'll help you out. If you already have a way that works for you, or if you find a better way, wonderful! 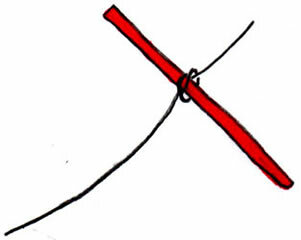 If the string breaks continually at the point of contact with the tuning pin, you might have a sharp edge where the string goes through the hole. To compensate for this, you can leave about a 1/2-1inch of slack before tuning up the string. This eases the point where it is sharp and usually takes care of the problem. And you can turn the tuning pin over so the sharp edge is on the other side. There is also some abraisive cord you can use like dental floss in the tuning pin hole.There are 2 sizes and they cost $3 plus shipping for both cords. The same might be true for strings that break at the soundboard. The bottom of the grommet may be cutting the string below the soundboard. To help this situation, put a leather washer between your string knot and the soundboard. You will need to put the washer on before you tie the string. You can get leather washers from Robinson's String Shop in California. (619 473-8556). If the string is breaking right above the soundboard you may need a new grommet, also available from Robinson's although you'll need to know if your grommet is small, medium, or large and if it is regular or heavy duty (they are not interchangeable). If there are too many winds of the string on the tuning pin, it may cause it to pop off the bridge pin. As the string stretches and tunes up to pitch, you may acquire more windings on the tuning pin then you want. The string is at too steep of an angle to the bridge pin and when you lever that string, it pops off the bridge pin. The solution is to unwind the string and push the windings away from the neck until the string is going straight up from the bridge pin to the tuning pin. If necessary, unwind the string completely and pull it up through the tuning pin about 1/2 inch, re-wind the string and tune it back up. Cut off the extra 1/2 inch of string. This should take at least 1 wind out of the string and it should stay on the bridge pin. Sometimes a tuning pin will slip due to changes in humidity. Most tuning pins are tapered like violin tuning pins. The pin gets larger in diameter on the side that the tuning key fits into. If you have a tapered tuning pin that keeps slipping, de-tune the string about a half of a turn and then as you turn the pin to tune the string back up, push the pin in. You should provide counter pressure by bracing the neck of the harp with your left hand, while pushing in with the key in your right. See a video of this here. You can also check the angle of the string to the neck. 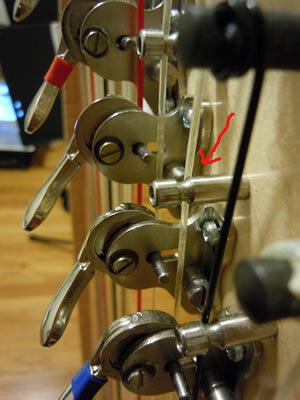 If the string angles towards the neck from the tuning pin, it could be putting back pressure on the tuning pin and pushing it out of the hole. This is more likely to happen in the low bass wires. The remedy here is to detune the string and stretch out the windings so they run straight up and down instead of at an angle. If there aren't enough windings, you probably have to put on a new string. Cut your string about 2" longer than the string length you need to allow for the extra windings. The above tips and helpful hints are specifically taylored for Thormahlen Harps. Some suggestions on tuning your harp, back to the strings page or on to the page About Harps.